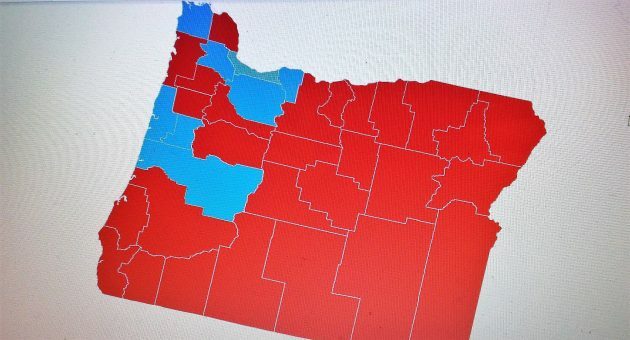 Oregon counties and their votes for president last November. Oregon is not about to change its constitution to resemble the federal system of allocating delegates to the state legislature. But the map above shows why in the red counties, including Linn, sentiment for doing so keeps popping up. Two Republican representatives, Carl Wilson of Grants Pass and Gene Whisnant of Sunriver, introduced House Joint Resolution 6. Two others, Bill Post from Keizer and Greg Smith from Heppner, signed on later. Their bill calls for the state Senate to be increased from 30 to 36 members, and for one senator each to be elected from every one of our 36 counties. The bill would be put to the voters as a constitutional amendment, but only if hell froze over and the legislature approved. The House Rules Committee held a hearing on the bill on Feb. 21, as a courtesy to the sponsors. Even before it was written the bill was dead. There are two problems. One is the map above. The red counties are where Trump was favored for president. If state senators were elected by counties, the Senate would have, probably, 28 Republicans and six Democrats. The big Democratic majority in the Senate now would never allow this to become a possibility by favoring this change. An even bigger obstacle is Reynolds v. Sims. In that sweeping Supreme Court opinion of 1964, Chief Justice Earl Warren struck down all state voting systems not based on population on the grounds that they violate the Equal Protection Clause of the 14th Amendment. States still had some leeway to follow political or other boundaries in their legislative districts. They could even try multi-member districts. But not if any of these things resulted in substantial differences in the weight of any single vote. What about the federal system, where even tiny states have two votes in the Senate the same as big ones many times their size? The federal analogy, Warren declared, “is inapposite and irrelevant to state legislative districts.” For one thing, he wrote, states at least theoretically and at the beginning, were sovereign entities giving up some of their status to make the federal union work. Counties, cities and other subdivisions, by contrast, are all children of the states that exist only to help the states carry out their work. Justice Warren also, rather breezily, dismissed other arguments for legislative districts with unequal numbers. Trees don’t vote, he wrote. Citizens do. And as for the problem of sparsely populated areas having districts so large that effective representation was hard, he thought that in he mid-60s transportation and communication had progressed far enough to make that point disappear. The question is, why have 2 legislative bodies representing the same thing? Why not have a unicameral legislature with twice as many members (or three or four times as many members, which would make districts smaller and more representative of the people they contain) as the current lower house? When the Warren Court handed down the Reynolds v. Sims decision, that is the way every state should have responded. It made state senates pointless. Supremely (no pun intended) glad we have the 14th amendment & the Warren court! And yes “citizens” vote – NOT corporations! The Warren court decision should have been struck down long ago by a later court who can read the tenth amendment. It cannot be nullified by a simple court decision. It seems to me, if amendments come into conflict with each other, the original one should prevail unless and until it is itself amended by the required steps. Oregonians should have more pride in their fair State. Maybe they should just give every one vote per acre of land they own. I’d imagine the Democrats would prefer 1 vote per 100k of GDP produced. Agree with David Boone; it makes no sense to have two legislative houses when both are apportioned on population. Going (way) back to high school civics class (remember that, old-timers?) Nebraska was/is the only unicameral legislative body state. I’ve often wondered why after the Warren Court decision. Legislators, self-interest is the only thing I come up with.